There’s always a factor of the unknown when a stranger comes to provide service at your home. We get it! And that’s why we only hire technicians that we would send to our own homes. We want our customers to feel comfortable with inviting us onto their property for service, so here are a few things to know about our team. When you hire Van Delden for service on your system, a background-checked team member wearing a Van Delden uniform shirt will arrive in a clearly marked Van Delden service vehicle. If requested, we can provide a courtesy call when we are on our way. You’ll usually have one technician for your service, however, we do cross-train so occasionally we may send two techs. For most service calls, our service techs do not need to enter your home. Occasionally, if an electrical breaker is located in a garage (or the like) we may need to access that for power to the system. If we’re visiting because an inspection has been ordered for the sale of your home, for a conventional septic system, our inspector will need to enter your home to run water and flush commodes. When that happens, you’ll be working with a Van Delden family member or owner. We do not need to enter a home for an aerobic system inspection. Help ensure the safety of your children and pets by keeping them away from the area where we are working. Holes dug in the yard and open septic tanks are no place for curious kids or pets to be playing. Even friendly dogs can get in the way of doing an efficient job, and are likely to be sniffing tools that are less than clean, due to the nature of our business. 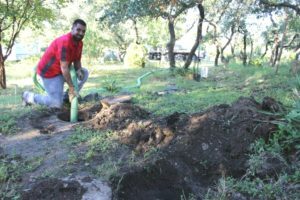 If you have any questions about what else to expect or about your septic system in the San Antonio, Boerne or Texas Hill Country area, give us a call at 210-698-2000 or fill out our contact form.